In 2005 I joined a company which was primarily focused on implementing SAN infrastructures. Due to the growing customer demand for VMware environments they asked me to fill in the VMware consultancy piece, which I was very happy with obviously. At that time I was the only one doing VMware within the company which made it really hard work to get up to speed, which I couldn’t have done without the VMware Communities at that time! I’ve always been someone who likes to have certifications on stuff that I’m working on and the idea of being one of the few within the VCDX community drove my eagerness on getting the VCDX certification. The complete journey for me (VCDX3) took about a year. First of all I started with the Enterprise Administration and Enterprise Design Exam which could only be done abroad due to the limited amount of Pearson Facilities delivering the exams. Secondly, with approval of my customer, I started to translate customer’s vSphere Design for delivery to VMware. Last but not least I got invited to present and defend the VCDX design that I submitted. As said multiple times on different blogs: “know your design”. It is very important to have a valid technical and/or organizational reason for the design decisions that you made within the design. Basically there is only one thing that I would do differently and that’s all about personal life. I stressed myself so much on the VCDX Track that I actually became sick after doing the defence. Guess a lot of stress got relieved 😉 So my lesson learned on this one is to not stress myself so much. 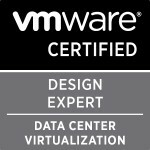 I joined VMware Professional Services (PSO) like a month after getting the VCDX certification which basically means that I was already talking to VMware about the position and that my former employer also knew I was leaving at the time I was doing the last steps in the VCDX track. Was it worth it? Definitely! While working for VMware I got the luxury of becoming a VCDX Panellist member (after internal education) and I learned so much more during that time! Looking at me as a freelancer nowadays I also benefit with the VCDX certification since it’s still a very unique certification which is getting more and more attention lately. Categories: Certifications, VCDX, Virtualisation | Tags: VCAP, VCAP5, VCDX, VCDX5, VMware | Permalink.